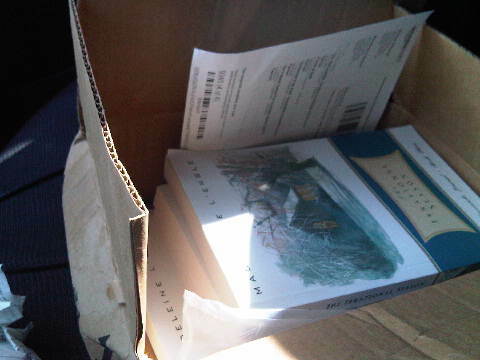 Madeleine L’Engle’s books arrived from my Amazon.com order on July 14, 2009. I was ecstatic. I picked them up at the post office myself and couldn’t wait till I got home to open them. It has been over a year since I started with the first volume of the Crosswicks Journals and now I am proud to say that I have finally reached the last few chapters and am 80% finished. I have to confess, I’m such a mighty procastinator when it comes to my creative life. Reading through Circle of Quiet has shook me at an intensity of 7.1 in the Richter scale. It had me face the facts. I am scared to pursue my dream of becoming a writer because I feel that this desire has been invalidated 5 years ago when I decided to take a detour and go for an MBA to meet my parents’ expectations of giving myself a stable future. I am scared to journey alone. I am scared about the amount of time it would need from me and I am not sure the weight of work obligations will allow me to do what is needed. I am scared that all the time and money spent in pursuing this dream will not make me produce anything at all. Aside from that it has made me face a lot of my desires that I have set aside since I started the responsible trek of being a professional HR practioner. I have set aside my desire of putting up a foundation that will bring an appreciation of arts back into the youth of my country. A foundation that will open opportunities for young people to live authentic and faithful lives through practicing and appreciating artistic mediums and crafts. I have set aside the research I have begun 2 years ago in putting up this foundation. I have set aside dreaming about the people I will be working with to help me set it up. I have set all that aside because I am afraid I have always pressed against roadblock after roadblock and there seems to be just no way to go about it. That’s the dirty laundry so far. Reading L’Engle’s journal has shook me because it showed how much of a coward I have been. Hiding behind the guise of an occupation that allows me to live a comfortable lifestyle and engage in some of the things that I enjoy. And I call it sacrifice. But who am I kidding? It is not sacrifice. It is repression. Sacrifice is like incense that burns a sweet aroma under the feet of God. Repression breeds bitterness and the foul smell of rotting dreams. So the next few days of chronicling will be about what I have done to be a step nearer the dream I have held for quite a long time and hopefully I will recognize again and be propelled into the motions of pursuing it. Has all been about getting in touch with the flow. Responding quite introspectively to all the things I am reading. Responding positively to the interactions around me. Digging up the truth about what I really think and feel about a person, an issue, a circumstance. I have also started searching for avenues and channels where I can learn about pursuing creative writing and landed with Stanford, Harvard, UCLA extension courses online. So far what has interested me was a short 10 week course in Stanford on Creative Writing as a Way of Life. Unfortunately the course is closed but I applied under the wait list just in case. I haven’t surveyed Harvard and UCLA options thoroughly enough but should get on it soon. A burst of anxiety has forced me to ravage the web for information on possibilities to engage in creative writing. I emailed my business school mentor to ask for information and talked to her about my idea of a foundation. She said that the idea was good but the financial aspects of it might be a problem. I have not released my trump card on the matter but I talked to my Dad today about the idea and he has known me for being persistent about it. He told me that he has also been thinking about putting up one. A Facebook message to a writer friend asking her thoughts about studying writing and lit engaged us in one of the animated discussions I’ve been waiting to have for the longest time. She told me to check out the Ateneo for opportunities and from there I landed at the Center for Continuing Education website and found that there is a Literature Appreciation course that will run for 4 Saturdays starting November 13 to December 4. Is that a divine appointment or what? I told my parents about it and so far they are in agreement. So what is this fear thudding behind my chest? Sigh. It’s been a while since I did something outside my comfort zone. But I shouldn’t stop there. I have to get myself out there. Jesus started his minister at age 33.